The Lotus Lagoon in Candidasa. Many holidaymakers skip this sleepy village in favor of more sought-after Balinese getaways like Ubud, Kuta and Uluwatu. However, a trip to Candidasa can be just as rewarding, especially for travelers who are looking to truly switch off from the world. 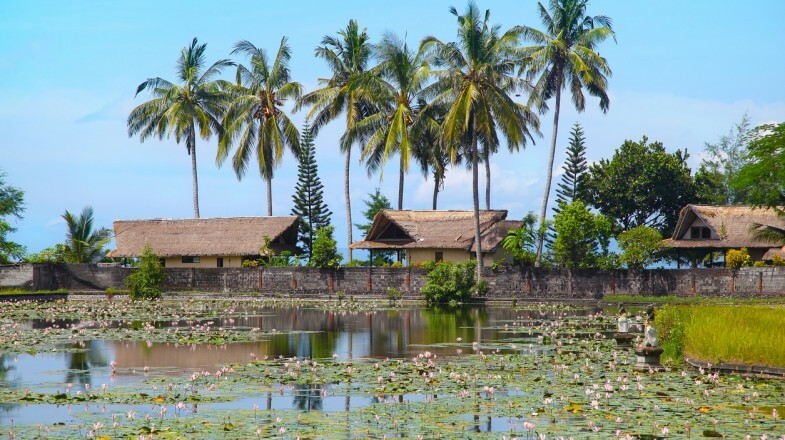 This eastern Bali gem is characteristic for its peaceful ambient, gorgeous lagoons and romantic sunsets – making holidays in Candidasa an ideal choice for visitors looking to unwind in ultimate peace and quiet. In the hills surround Candidasa, about 4 kilometers from the town center, you will find the oldest Bali Aga village. This settlement belongs to the oldest indigenous tribal group in Bali. Goa Lawah Temple is a sacred site that dates back to 11th Because of its unusual layout, it is known for hordes of bats that reside in the surrounding caves. Candidasa Lotus Lagoon in one of the town’s most enchanting sights. It features a lush pond covered in pink and white lotuses and lily pads. It is the perfect place to unwind and meditate. Just west of Candidasa and near Padang Bai, you’ll find Bias Tugel beach, a secluded 130-meter-long stretch of pristine white sand and iridescent waters. If you happen to be in Candidasa in June, make sure to visit the Makare-kare Festival. During this ceremony, men of the Tenganan village organize fights, armed with pandanus leaves and bamboo shields. This is a practice of honoring Lord Indra, the protector of the village. Those who are looking for outdoors adventures will be pleased to hear that Candidasa is the ideal starting point for trekking Mount Agung, Bali’s highest mountain. Candidasa is also one of the prime diving spots in Bali. In its vicinity, you’ll be able to see the famous USAT Liberty shipwreck, as well as several islets famous for their coral gardens and rich aquatic life.